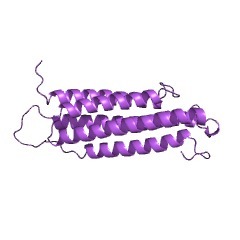 Thought to possess an F-actin binding function. The I/LWEQ domain is a ~250-residue actin-binding module that is found in the C termini of functionally diverse proteins from yeast to mammals. The I/LWEQ domain contains four conserved blocks and has been named after the conserved initial residues of blocks 1-4. The I/LWEQ domain is generally found near the C terminus and in association with other domains, such as FERM or ENTH. The I/LWEQ domain has been shown to bind to F-actin and to bundle actin filaments [(PUBMED:9159132), (PUBMED:10581178), (PUBMED:16415883)]. 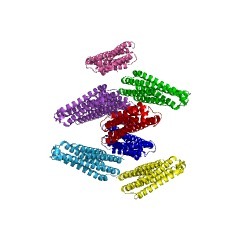 The I/LWEQ domain contains a proteolysis resistant-core that has an all-alpha-helical structure composed of five long down-up-down-up-down antiparallelhelices connected by short loops and one short connecting alpha helix arranged in a progressive topology. 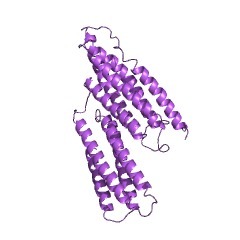 The proteolysis-resistant core is followed by a C-terminal latch region that adopts an alpha-helical conformation. The latch region can mediate oligomerization of I/LWEQ domains, possibly as dimers, and this seems to enhance the F-actin-binding ability of the proteolysis-resistant core [(PUBMED:16415883)]. It's worth noting that the I/LWEQ domain has also been called the talin-HIP1/R/Slap2p actin- tethering C-terminal homology (THATCH) domain (HIP1/R/Slap2p denotes similarity of Slap2p to HIP1 and HIP1R) [(PUBMED:6415883)]. There are 1612 ILWEQ domains in 1610 proteins in SMART's nrdb database. Taxonomic distribution of proteins containing ILWEQ domain. This tree includes only several representative species. The complete taxonomic breakdown of all proteins with ILWEQ domain is also avaliable. Click on the protein counts, or double click on taxonomic names to display all proteins containing ILWEQ domain in the selected taxonomic class. The I/LWEQ module: a conserved sequence that signifies F-actin binding in functionally diverse proteins from yeast to mammals. Talin is an actin-binding protein involved in integrin-mediated cell adhesion and spreading. The C-terminal 197 amino acids of vertebrate talin are 45% similar to the C-terminal residues of Sla2, a yeast protein implicated in polarized assembly of the yeast actin cytoskeleton. Talin is also homologous in this region to nematode talin, cellular slime mold filopodin, and an Sla2 homolog from nematode. Analysis of the conserved C-terminal sequences of these five proteins with BLOCK MAKER reveals a series of four blocks, which we name the I/LWEQ module after the conserved initial residues in each block. Experiments presented here show that the conserved protein domain represented by the I/LWEQ module competes quantitatively with native talin for binding to F-actin in vitro. Furthermore, the corresponding domain of Sla2 binds to both yeast and vertebrate F-actin in vitro. Mutation of one of the conserved residues in the fourth conserved block abolishes the interaction of the Sla2 I/LWEQ module with F-actin. These results establish the location of an F-actin binding domain in native talin, demonstrate that direct interaction of Sla2 with actin is a possible basis for its effect on the actin cytoskeleton in vivo, and define the I/LWEQ consensus as a new actin-binding motif. This information is based on mapping of SMART genomic protein database to KEGG orthologous groups. Percentage points are related to the number of proteins with ILWEQ domain which could be assigned to a KEGG orthologous group, and not all proteins containing ILWEQ domain. Please note that proteins can be included in multiple pathways, ie. the numbers above will not always add up to 100%.